Free e-book: Prevent expense fraud with best-practice expense management. Most businesses don’t like to think about fraud. But, according to the Association of Certified Fraud Examiners (ACFE), it is estimated that Asia Pacific organizations lose approximately 5% of their revenue to fraud every year. Better understand the impact of expense fraud. 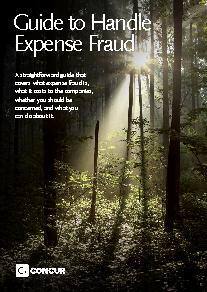 Learn how to identify and deal with expense fraud. See tips on preventing expense fraud. Get an expense fraud check-list.